If you’re contemplating buying a house, especially in an urban area, you may be asking yourself: Is buying a condo a better deal? A condominium, which is like a hybrid between an apartment and a house, is property that you can purchase and own outright. A condo offers some similar aspects of apartment living. For instance, many condos are adjacent to others, so owners often share a wall and live in close proximity. And if you live in a high-rise building, your condo may be located above or below someone else’s home. If you talk to friends or family members who live in condominiums, you’ll quickly find out that many people love the condo life, while some people wish they bought a house instead. Toying with the idea of committing to a condo? Here are top benefits – and some drawbacks – to factor into the decision-making process. Pro: You won’t have a yard to mow. This is a big appeal of owning a condo. There will be no mowing because you’ll pay dues to a condominium association, which will take care of most of your maintenance needs. Con: Having the outdoor workload managed isn’t always easy. Some condominiums are underfunded and don’t have the money to pay for regular maintenance. It’s important to ask a lot of questions and make sure the association is well-run before buying a condo, and find out how many condos the association manages. If a dozen members struggle with paying dues in any given month and your community has 500 condos, you aren’t likely to feel the impact. However, if you live in a community of 10 condos and two people fall behind, there goes 20 percent of the association’s budget. Pro: It’s cheaper than buying a comparable house. The cost of a condo versus a house depends on the size of the home, the property values of the neighborhood and the cost of living in the area. Typically, you’ll spend less on a condo, industry experts say, and historically, single-family detached homes have appreciated faster than condominiums. However, while houses have appreciated faster than condominiums for years, research conducted by the online realty marketing and information company Trulia found that median condo market values climbed by 38.4 percent from February 2012 to February 2017. Meanwhile, single-family detached homes appreciated by 27.9 percent during the same time frame. Con: The price of the condo isn’t all you’ll have to account for. You don’t just have to think about appreciation and mortgage payments. Remember to factor in association dues. You could shell out anywhere from $100 a month to more than $1,000, depending on the location and whether you’re looking at a luxury or no-frills condominium community. Still, these dues are often going to amenities, such as 24-hour gated security or a first-class gym or pool. And plenty can go wrong inside a home, such as plumbing issues or your air-conditioning and heating unit could go out, for instance. You could also find yourself on the receiving end of an assessment. What’s that, you say? Every month, a portion of your condo fees goes into the development’s reserves. That’s where the condo association gets the money to fund occasional projects, such as repainting the building’s exterior. If an expense can’t be delayed – let’s say a pipe burst and there isn’t enough in the reserve to cover repairs – condo owners could be asked to pay an assessment, which can range from a minor pittance to thousands of dollars. These unexpected financial hits aren’t pleasant, but unplanned expenses occur frequently with houses as well. Also keep in mind that condos can be harder to sell than houses. You can brag to home buyers about your spacious bedrooms or all the amenities in your condo building, but if many of your neighbors are also selling at the same time, there may not be much to distinguish your condo from theirs. Pro: There is a sense of community. 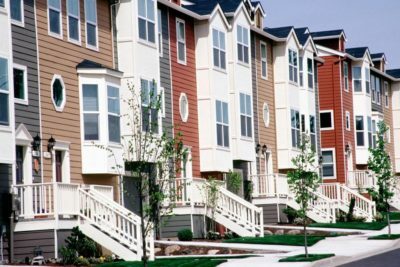 Plenty of people who own houses would say the same thing about their own neighborhood, but remember condo owners tend to live in much closer proximity than many suburban homeowners, who often have relatively big yards separating them. Mark Scott, a New York City-based corporate communications executive for eVestment.com, a website aimed at the investment community, says that he became a more social person living in a condo. Con: You can’t pick your neighbors. Scott likes the social, community-driven aspect of living in a condo, but there are downsides, too. Scott says that he has heard of friends who moved into buildings on the recommendations of others – and then had fights with those friends, making living in the same building uncomfortable. “That never happened to me, but it’s certainly a possibility in communal living like that,” he says.